Invited guests of the South Shore Convention and Visitors Authority and Lake Court House Foundation gathered at the Crown Point Courthouse on Tuesday, March 3, for a sneak preview of the new John Dillinger Museum. "The South Shore CVA is very excited to work with the Lake Court House Foundation on moving the museum to Crown Point, the location of Dillinger&apos;s infamous escape from the old Lake County jail 81 years ago today," said Speros A. Batistatos, president and CEO of the South Shore CVA. "The museum will tell the history of Dillinger and his gang with a strong ‘crime doesn&apos;t pay&apos; message." Sneak preview attendees were able to walk through a third of the museum space to get an idea of how the layout will look. The new museum plan includes reusing some exhibits and artifacts from the original location, such as Dillinger&apos;s death pants and death mask, and a display of G-men toys. The new museum will incorporate new, previously unseen items from the South Shore CVA&apos;s collection. 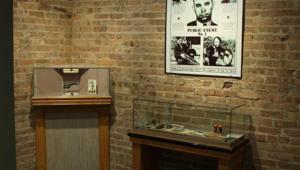 The museum is scheduled to host the grand opening on July 22, 2015 - the 81st anniversary of the death of John Dillinger.